Blast that Sally Struthers. There she was, a Yoda-like avatar, whispering in my ear as I nibbled on nibbles of foie gras and caviar at Per Se. With each bite, she whispered, “Remember UNICEF, the starving children. For the cost of each morsel, you can feed a family of four for a year.” I knew she was right, but the food, the service, the view… Still, guilt was trumping enjoyment and I needed to make her disappear. Then it hit me, by the time course number two of eight arrived at the table, I had decided that the only way to rationalize the meal was to create my very own “Hunger Off-Set Program” (or HOP). It works like a carbon off-set program. Anytime my food consumption crosses the line from being merely excessive into the realm of unconscionable, I would make a donation to a hunger charity. A win-win, I got to gorge, but then paid for it twice. In a large skillet, heat the butter until melted. Add the lemon juice and the wine. Cook together for about a minute. Add the cream, a touch of salt, and some black pepper. Cook over medium heat for a couple of minutes until slightly reduced. Add most of the caviar and mix together over low heat for a couple of minutes. Cook the pasta until al dente. Drain it, but retain a cup of the cooking water. 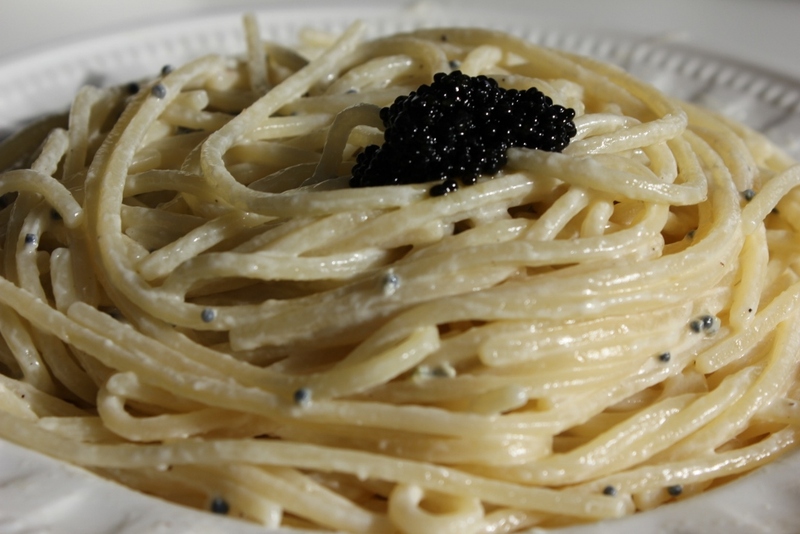 Add the pasta to the caviar mixture. Heat together for a minute, adding a little bit of the water if it seems dry. Serve immediately with a garnish of caviar. A sybarite’s recipe if ever there was one. Per Se indeed! Next week – and of course it’s at your splendid prompting – I’ll be at Osteria Angelini for lunch. Since Gino made it especially for you, I will try to order that Spagetti Chiturra with the truffles in advance as my personal holidsy homage to you. Buona Nstale e Buon Ano! and enjoy the pasta con tartufi!